Henri-Chapelle American Cemetery, which covers fifty-seven acres, is located in Homburg, Belgium. There are thirty-three instances of two brothers interred next to one another in addition to one instance of three brothers resting side by side. There are also tombs of ninety-four unknown soldiers. American soldiers with the 1st Infantry Division liberated the region in early September 1944, and by the end of the month, a temporary cemetery had been established. 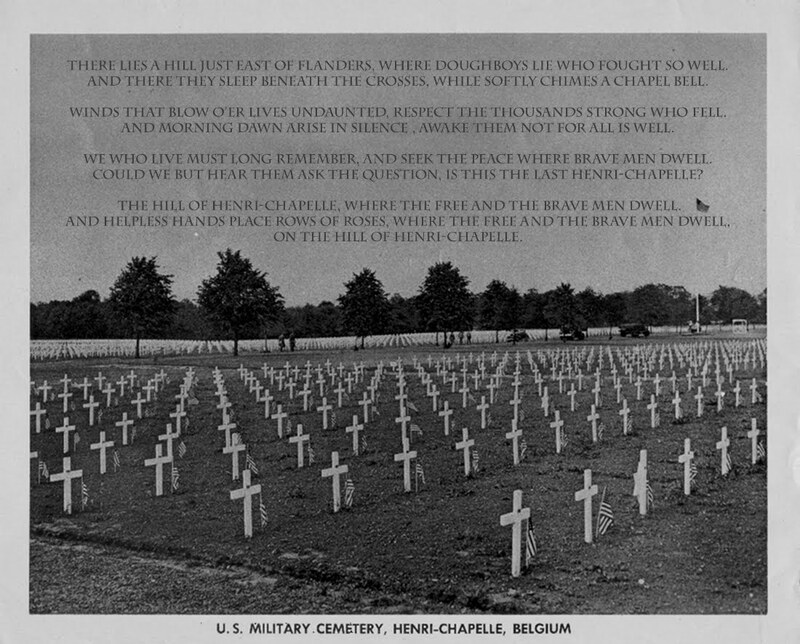 By the end of the war, Henri-Chapelle was the largest temporary American cemetery in Europe with over 17,000 soldiers interred there. The repatriation program began in July of 1947, with more than half of the 17,000 soldiers being returned to America for burial. The completion of Henri-Chapelle as a permanent American cemetery occurred in 1960 and today is regulated by the American Battle Monuments Commission. They Speak is currently trying to obtain the stories and photos of the men interred at Henri-Chapelle along with each name listed on the Missing in Action tablets as a measure of gratitude as well as appreciation for their sacrifices. Additionally, They Speak wishes to collect the stories and photos in attempts to preserve and communicate them for future generations so the memory and identity of each name is not forgotten. Teachers from local schools bring their students to Henri-Chapelle on educational fieldtrips and walk amongst the markers, stopping at random graves to reflect on and to discuss who is interred there. Local residents also can adopt a soldier. These men have stories to share, voices to be heard, lives to be remembered, and sacrifices to be honored. They Speak is dedicated to achieving these goals.